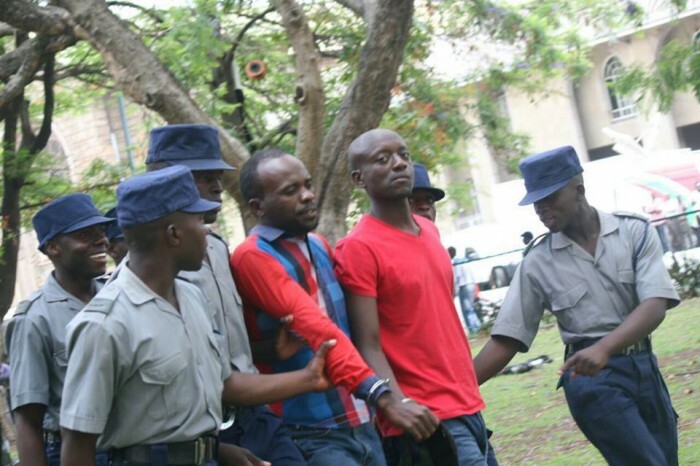 Can you please highlight the plight of Zimbabwean Journalist and activist Itai Dzamara. In 2014, a lone Itai Dzamara was inspired by the global Occupy Movement and started an Occupy in Zimbabwe's Africa Unity Square. Itai advocated for the occupation of the Africa Unity Square in Harare as a way of communicating dissatisfaction in the country's leadership particularly Robert Mugabe and his Zanu-PF government. Itai Dzamara went to the extent of writing a letter to Mugabe requesting him to retire from office. He hand delivered the letter to Mugabe's office. He was arrested after the delivery of the letter and later beaten up by the Zimbabwean police. Yesterday Itai Dzamara was kidnapped by the Zimbabwean secret police and no one knows where he is. Can you please stand in solidarity with him and put it out on every social media platform. Please find links to news stories about him on Zimbabwean news sites this story needs to go internationally for the Zimbabwean government to be forced to free him. Esquire names Micah White one of the most influential under 35 year olds alive today. I’m not satisfied anymore with just the standard repertoire of activism. We have to really rethink the foundation of activism. And that’s what I’m trying to do. My thinking is moving away from protest. Instead, I’m more interested now with the power of social mobilization. The power of, basically, getting large numbers of people to change their behaviors, to depattern themselves, to actually get the facts collectively in order to tackle global challenges. I think where it’s going now, it’s much more towards the Five Star in Italy, where they do things like getting people elected or, like, running very complicated organizations that are able to manage global problems. One of the things that’s happening is that we’re seeing these global problems that everyone faces, like Ebola, and that social movements might be the answer to those kind of problems, too. Right? Because they mobilize large numbers of people. They get large number of people to do highly synchronized actions together. I was a sophomore in college at Swarthmore on 9/11. And that was, like, the inflection point. And that was the point, too, that I kind of, like, really changed my approach to activism and tried to directly influence, like a lot of people, the war. I started to see the power of the Internet to allow for global action at the same time. Like, on February 15, 2003, we had, like, a global synchronized action on every continent on earth. Which I think would’ve been impossible prior to the Internet and stuff like that. Arab Spring is absolutely crucial. And it was absolutely crucial for my own development because I have lived in Egypt for nine months in, like, you know, 2005 or 2006. My wife’s father is a former ambassador to Egypt. I remember staying at the embassy and seeing, like, how many police officers Mubarak would employ to, like, keep order in his society. I mean, I remember seeing that and I remember thinking, at the time, like, “Wow. A revolution would be impossible here with all these police officers.” Like, they would have dozens and dozens and dozens of police officers everywhere. Then, lo and behold, a revolution happened in Tahir Square. That opened my eyes. I’m at the library and I’m reading all these books about revolution. Is there a pattern that always happens? And there is. De Tocqueville is who observed that that revolution often just functions to strengthen state power. I think that that’s why the movement towards kind of, you know, horizontalist, Internet-enabled, populist movements is a way to not repeat that pattern. The total cost of Occupy was probably under, like, $500. It’s ridiculous. It’s like a force multiplier. That is allowing history to be changed very rapidly. The paradigms of activism are in crisis. 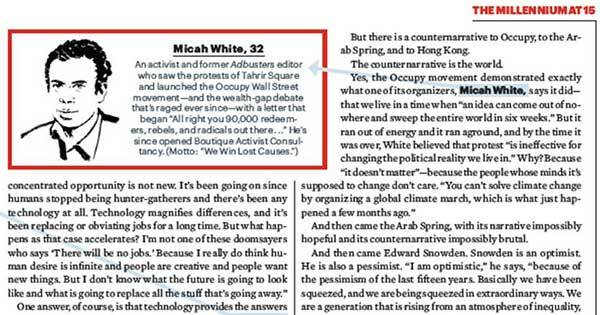 "You can't solve climate change by organizing a global climate march," says Micah in the latest issue of Esquire.